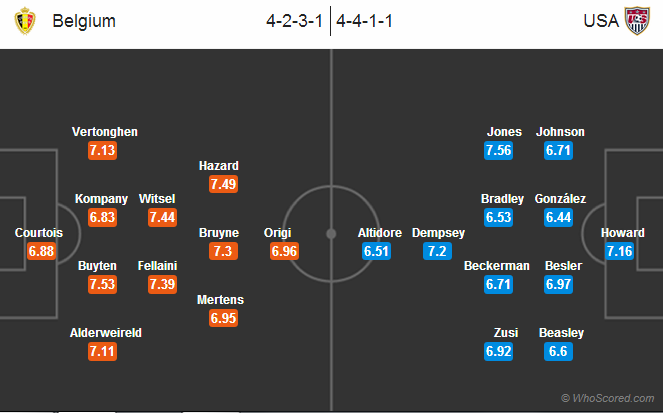 Possible Lineups: Belgium vs USA Belgium will meet USA in the round of 16 game of the World Cup at. Belgium will meet USA in the round of 16 game of the World Cup at Arena Fonte Nova. Both the teams have been brilliant so far in this World Cup with USA qualified along with Germany knocking Ghana and Portugal out of the World Cup. Belgium have an average age of 25.5 while USA have 28.8. Stat: USA have only won a single game in the past five meetings against Belgium. Steven Defour will be unavailable for Belgium following his suspension. While captain Vincent Kompany is also a doubt due to a groin injury. Meanwhile, United States striker have Jozy Altidore has returned form a hamstring injury. USA are free of injury concerns. Chelsea star man Eden Hazard has not done something exceptional in this World Cup. People expected much from the youngster but has not fulfilled their expectations. Hazard has set up two goals but has not found the back of the net. But this time he will make a difference and will be a man to watch. Belgium 2 – 1 USA, Hazard to score a goal.